Not all printers are created equal. Digital and offset printing differ in many ways and offer their own list of pros and cons, but the main deciding factors are the size of the printed piece and the quantity desired. In this post we will break down the difference between digital and offset printing and discuss when to use each. 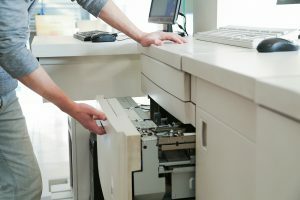 A digital press operates much like your home or desktop printer where a computer sends the image directly to the printer, instead of utilizing printing plates. A digital press prints by depositing pigment or toner onto the surface. The toner does not permeate the paper like conventional ink used on offset presses. Because these printers use a toner pigment the files they receive will need to be set up for CMYK/4 color process printing. Most are not capable of printing PMS colors, but replicate the spot color very well when the files are set up correctly. Digital printers are most commonly used for “short runs,” printing small quantities of a few dozen to a few hundred, and for printing flat pieces no larger than 12” x 18”. Many digital presses do have the capability to print a special coating on the paper that can give you a protected surface to help avoid scratching. They can also print special effects with this coating process that looks similar to spot varnish or a clear raised texture to bring life and interest to your images. While there are many options for papers that can be used on digital presses, there are limitations to the thickness. 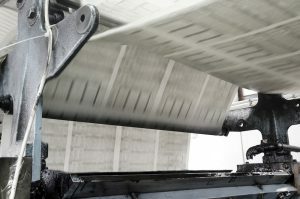 Sheet fed/offset printing presses use a technique in which the image is transferred (or “offset”) with ink from a plate to a rubber blanket, then to the printing surface. This is commonly called Offset Lithography and is one of the most common ways of creating printed materials. Many modern offset presses use computer-to-plate systems as opposed to the older computer-to-film workflows, which further increases the consistent high image quality. Offset printing also allows you to use PMS colors inks instead of 4-color process if so desired. You can also print PMS inks along with the CMYK/4 color process inks to give you more color variations in your printed piece. Compared to older digital presses, offset printing produces sharp, clean images and type as it has the ability to adjust the amount of ink applied to the paper, enabling a much more precise result. However, newer digital presses are capable of printing a quality that rivals traditional offset printers. Additionally, offset printing also gives you the ability to use more than one coating process at a time. So your marketing piece could have both a gloss and dull varnish to enhance your design. Offset printing is best suited for economically producing large volumes of high quality prints. A typical offset press can handle paper sizes up to 28” x 40”. Offset printing is the cheapest method for producing high quality prints in larger printing quantities. It also allows you to print more than one of each large piece up on the sheet depending on the flat size of the art. For instance if you are printing a pocket folder and want to print a brochure at the same time, provided the flat sizes equal no larger than the printed sheet size and you are using the same weight of paper, you can gang these two pieces on the same press run. This reduces waste and your overall cost. In addition to traditional offset printing there is web-fed offset printing. Web-fed offset presses print on continuous rolls of paper and is generally used for runs in excess of five or ten thousand impressions. Some web presses print at speeds of 3,000 feet per minute or faster. The paper is fed through the press at speeds ranging from 5 to 50 feet per second. 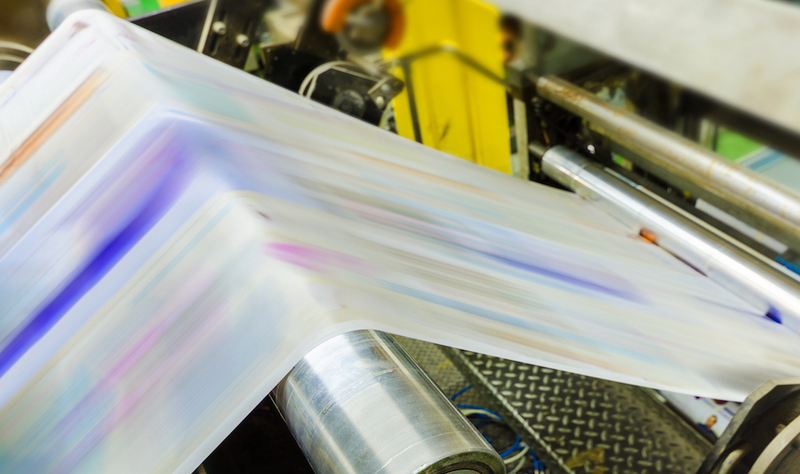 In addition to the benefits of speed and quick completion, some web presses have the inline ability to cut, perforate, glue and fold all at the same time so your printed piece comes off the press as a completed product. Web offset presses can either transfer text and images to one side of the paper at a time or print on both sides simultaneously. The typical paper width used on web press can go up 56 inches wide and as long as the length of the roll. Common examples of web printing include newspapers, newspaper inserts or ads, magazines, direct mail pieces, catalogs, and books. Your design team and/or printer can help you determine which approach is best for your piece. The printing process can affect some elements of design, so it is always best to engage a team who can think ahead to the final piece and work backwards to design for the right printing process. I want to make sure that I use the right kind of printing press. It’s interesting how offset printing presses work! I can see why they would be good for using more specific colors. Thanks for explaining when it could be good to use digital printing or offset printing. I didn’t know that digital printers are ideal if you want to print out a few dozen or a few hundred of things. I’m interested to learn if this could be ideal for printing out paper advertisements or something like that. Such a great content and I really appreciate your article thank you for sharing that type of article. I found it interesting how you mentioned how digital printing is best used for small batches of paper compared to an offset press. My wife and I are in the process of moving across the country and we are having an estate sale to help fund our travels. Because I want to get the word out around the neighborhood and not much further than that, I will keep this in mind as we search for digital printing services near us!